The Economist publishes its widely anticipated article on Bangladesh’s International Crimes Tribunal. ICT chairman issues order accusing The Economist of hacking his private phone and skype conversations. See here for further details. Defence witnesses limited to 12 by ICT tribunal. The defence counsel have been refused two foreign expert witnesses willing to testify for Professor Ghulam Azam. Ghulam Azam indicted for war crimes by the International Crimes Tribunal. See here for further details. A bizarre day at the ICT on Thursday to say the least! 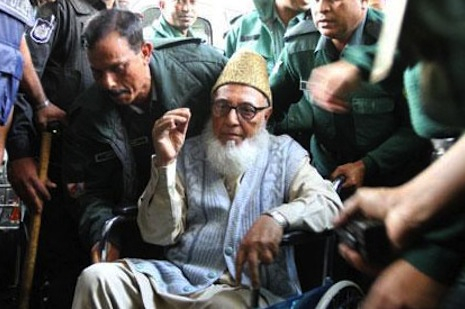 It seems that in presenting formal charges Jamaat-e-Islami leader Abdul Quader Molla, the hapless prosecution counsel, Mr Sultan Mahmud, earned the dissatisfaction of the judges when he consistently made errors of historical fact, wrongly named officers of the Pakistani Army and even the names and titles of the tribunal judges! The prosecution produced a video as part of their evidence. The 55 minute documentary did not have any footage of Ghulam Azam at all. See here for more information. The hearing on the formal charges against Professor Ghulam Azam’s charges at the International Crimes Tribunal began this afternoon. The verdict on Azam’s bail petition has been delayed until 23 February. Ghulam Azam’s bail petition has been delayed. It may be held tomorrow but the date has not yet been given. The Bangladesh government will by now be aware that the UN Working Group on Arbitrary Detention has stated that the detention of other political leaders is in contravention of Article 9 of the Universal Declaration on Human Rights and Article 9 of the International Covenant on Civil and Political Rights. Ghulam Azam’s youngest son publishes article in Naya Diganta on his father’s arrest. The article (in Bangla) can be found here. A translation will follow shortly. The family continues to have concerns regarding Ghulam Azam’s health and treatment in custody. He has not yet been charged, let alone convicted of any crimes yet is being treated very poorly. He has only recently been given access to his lawyers and is still being denied reading material and regular contact from the family. Ghulam Azam’s son, Amaan Azmi responded to allegations that he was involved in the recent “foiled coup” by Army officers. He strongly denied the accusations, saying that he had served the army for 30 years with honour and would support punishment of anyone involved in such a plot. Further information here. 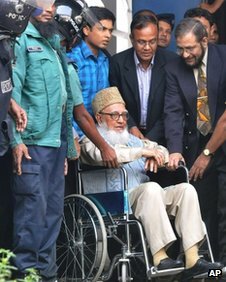 Professor Ghulam Azam was taken to Dhaka Medical College Hospital for an MRI scan today. He was then transferred back to BSMMU hospital until further notice. No date has yet been given for his transfer to prison, however his family are continuing to lobby for bail or as a minimum, division when in prison. He continues to suffer from a number of medical problems, including back pain and gallbladder problems. A member of the defence team was arrested and detained today for photocopying documents. Ghulam Azam remains in hospital. The previous low quality of food has improved since his family made complaints about this, although it is still inadequate. Despite media reports announcing him to be fit and well, he suffers from a number of age-related complaints including back pain, requiring regular physiotherapy. He has also been denied access to a Quran, which violates universal human rights standards. An application for division [a higher standard of prison accommodation] has been made. An article was published in Amader Shomoy today which states that the UN Human Rights Commission has demanded that the Bangladeshi Government explain the arrest of political leaders including Matiur Rahman Nizami. This letter, sent by the Working Group on Arbitrary Detention was written to the government on September 12th requesting a response within 60 days, however this deadline has since been extended. This demonstrates the level of international concern about the so-called International Crimes Tribunal, and we await further comment from the UN with interest. Please speak out about this inhumane treatment of a wrongfully accused victim of the Awami League government. See How You Can Help for more information. Human Rights Watch published its World Report recently, and also posted an article on its website entitled Bangladesh: Tightened Control and Broken Promises. This documents human rights abuses in Bangladesh under the aegis of the Awami League government, including a rise in extrajudicial killings, disappearances, harassment of human rights organisations, and torture. Charges have been filed against seven people accused of war crimes during the 1971 war for independence. The first trial under the tribunal began in September against Delawar Hossein Sayedee. Some important amendments were made in June to the International Crimes Tribunal (ICT) Rules of Procedure, which included ensuring the right to a presumption of innocence, the right to a fair and public trial, the right against double jeopardy, and the right to counsel of the accused’s choice. However, these amendments did not address other important shortcomings in the rules, such as the denial of interlocutory appeals, the need to establish a defense office, and the need to repeal article 47(A) of the constitution, which denies fundamental rights under the constitution to individuals accused under the ICT Act. The provision even bars claims that article 47(A) is unconstitutional. The proceedings in Sayedee’s case raise serious concerns about the impartiality of the bench and the rights of the accused to a fair trial, Human Rights Watch said. The accused has been denied access to foreign counsel of his choice, and the defense teams contend that defense witnesses and investigators have been harassed. His statement was reported widely in the Bangladeshi media. See articles on BDNews24 or The Daily Star for further details on his statement. An English translation will be available shortly on this site. We strongly condemn this harassment of Ghulam Azam’s family who have been unfairly targeted as a result of his political activities. It also illustrates the lack of consideration of the truth in reporting by some media outlets in Bangladesh. A researcher from Ghulam Azam’s legal team was arrested today while photocopying documents for the case. According to BDNews24, the researcher was photocopying a document when a call was received by the New Market police station, purporting to be from the tribunal, asking them to detain the man. They also seized the documents which were being photocopied and refused to release them until the International Crimes Tribunal directed them to do so. The tribunal’s chairperson stated that the documents were confidential and needed to be kept secret. Judge Zaheer Ahmed denied knowledge of the phone call but refused to investigate further, saying “We will not go into that. It could have been a secret informant”. The judge also stated that court documents should not be taken to a public place for photocopying. However, the number of pages (in total over 25,000) made it impractical for the defence team to do otherwise. They were advised that, although this rule was not in place previously, they would need to apply for permission to photocopy documents in future. This is yet another example of the harassment of defence lawyers, which has been criticised by Human Rights Watch. It also highlights media bias in presenting the police and ICT in a favourable light even after subjecting an innocent person to unnecessary police detention, with no apology issued to the victim. This occurs in the context of giving the defence team only three weeks to prepare their case, thus wasting time and delaying them further. The international community has started to take note of the so-called International Crimes Tribunal and have raised questions about its legality and authority. During a roundtable discussion at CIRDAP auditorium yesterday, professor of Law at the University of California, Berkeley, Laurel E Fletcher, stated that “such trials run the risk of turning into political show trials, where laws are bent to produce predetermined results.” During this same discussion, it was claimed that criticising the trial was effectively, by extension, questioning “the very sovereignty of the country” – a ludicrous statement aimed at silencing opposition to the trial within Bangladesh. The Manchester Evening News published an article about the family’s concerns that Ghulam Azam will not receive a fair trial in Bangladesh. A Toronto-based human rights group, Bangladesh Watch, has criticised the actions of the Bangladesh government and condemned them as being politically motivated. 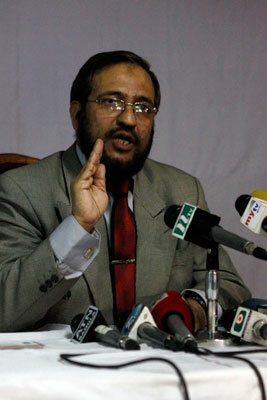 It has called for an end to the harassment of political opponents of the Awami League government. It has also emerged that the UN Commission on Human Rights had written to the Bangladeshi government for an explanation of the legal basis of the arrest and detention of six opposition leaders [from BNP and Jamaat-e-Islami]. Bangladesh have yet to respond to this demand.